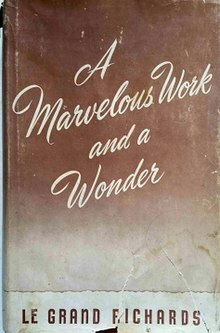 A Marvelous Work and a Wonder is a 1950 book by LeGrand Richards on the history and doctrine of The Church of Jesus Christ of Latter-day Saints (LDS Church). The book was intended as a missionary tool and is traditionally cited as the best-selling Mormon book of all time (not including the standard works). As of 2001, it was said to have sold over three million copies. In 1937, as president of the LDS Church's Southern States Mission, Richards wrote a document entitled "The Message of Mormonism" to assist missionaries in presenting Mormon teachings. In 1950, as presiding bishop of the church, Richards expanded his document into a full-length book, which he named after a phrase used in the King James version of Isaiah 29:13–14; Richards identified the teachings of the LDS Church as the wonder referred to. The book was published by Deseret Book, a publisher owned by the LDS Church. Richards donated all proceeds of the sale of the book to the missionary funds of the LDS Church. The book is considered a Mormon classic and for several years was among the few non-scriptural works that full-time LDS Church missionaries were asked to study. However, A Marvelous Work and a Wonder is no longer part of the "approved missionary library." ^ a b Lucille C. Tate, "LeGrand Richards: A Marvelous Work and a Wonder", Tambuli, February 1983. ^ Gary Gillum, "Out of the Books Which Shall Be Written ...", Dialogue: A Journal of Mormon Thought 12 (Summer 1979):99 at 101. ^ Lawrence R. Flake, "LeGrand Richards" Archived December 2, 2013, at the Wayback Machine in Prophets and Apostles of the Last Dispensation (Provo, Utah: Religious Studies Center, Brigham Young University, 2001), pp. 489–91. ^ LeGrand Richards, "What the Gospel Teaches", Ensign, May 1982. This article related to a book about the Latter Day Saint movement is a stub. You can help Wikipedia by expanding it.